We had our orientation meeting last night. Besides getting a chance to meet my 10 travel companions (and relishing in knowing that I’m the only American), we also learned that this trip falls under the “Roam” category, which means much more independence to see and do what we’d like versus the more tightly controlled itineraries in Egypt and China. I’ve been in Thailand less than 24 hours but already know that I’ll return here. They call this country the Land of Smiles, which isn’t just a slogan. The Thai people are the most friendly and welcoming of just about any I’ve encountered on this trip. There is something about them — exactly what is hard to put your finger on unless you’ve been here and experienced their hospitality. Bangkok is, as most would expect, a traffic-clogged, chaotic and absolutely stifling place. But compared to some of the cities I’ve already visited, like Cairo and Beijing, it doesn’t seem nearly as bad — or, I’ve just grown accustomed to this all. My first stop of the day was the Grand Palace, which is the former Thai royal residence but is now used only for ceremonial occasions. 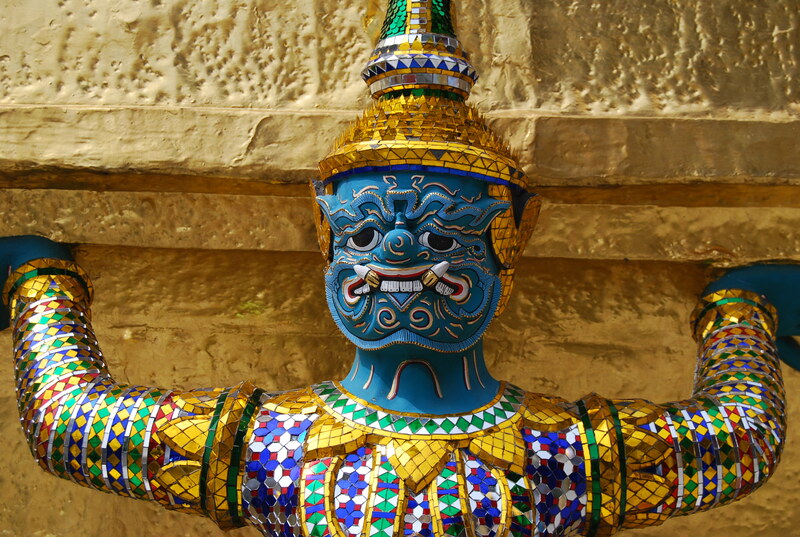 It’s also the home to Wat Phra Kaew or the Temple of the Emerald Buddha, a richly ornate shrine to a 75 cm statue that is carved from a solid piece of green jasper. The dress code for the palace requires pants, so I’d wanted to get there as early as possible. But, even by 9:30 a.m., the air was heavy with humidity and my shirt was already soaked through. 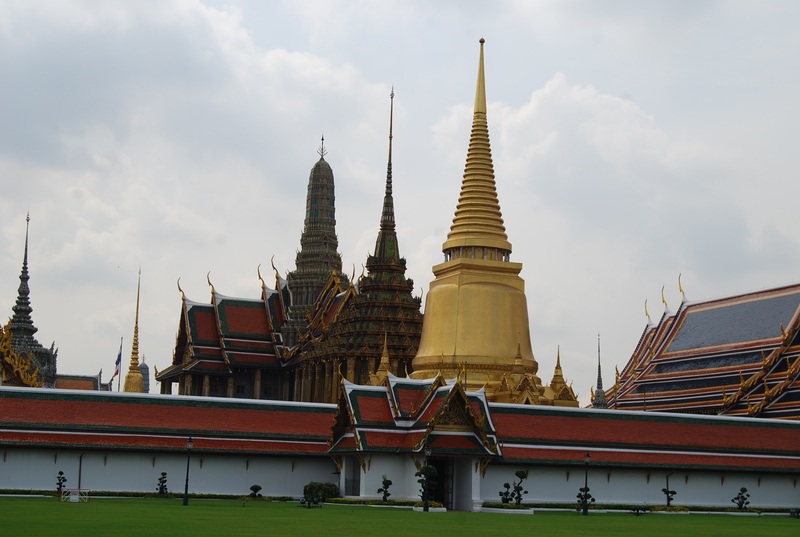 Many who visit Bangkok talk of “temple fatigue” — after a while, it’s said, they all start to look the same. If this is the case, I’m glad to have started my tour at the palace, which was a colorful, detailed and absolutely stunning introduction. It was hard to put my camera down. 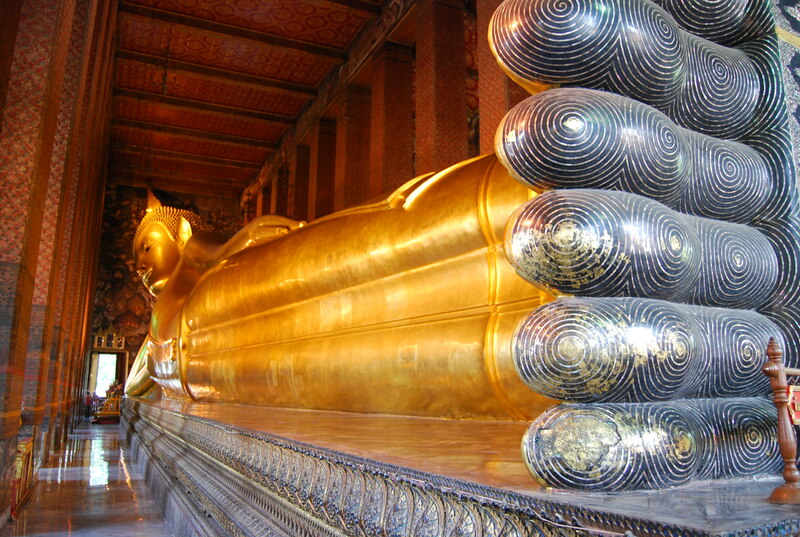 Right next door is Wat Po, better known as the Temple of the Reclining Buddha. 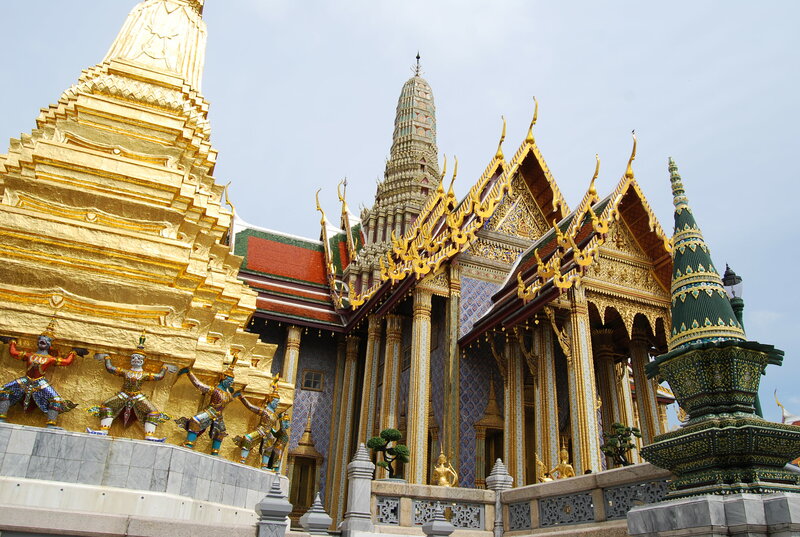 This is Bangkok’s oldest monastery and houses an absolutely huge (150 feet long, 50 feet tall) Buddha reclining on the elbow — his intricate feet are inlaid with mother of pearl. Wat Po is also famous for its traditional Thai massage school, said to be one of the best in the country. For around 400 baht, or $13USD, one of the students treated me to a wonderful hour massage, which as an added bonus, allowed for an escape from the heat into an air-conditioned treatment room. 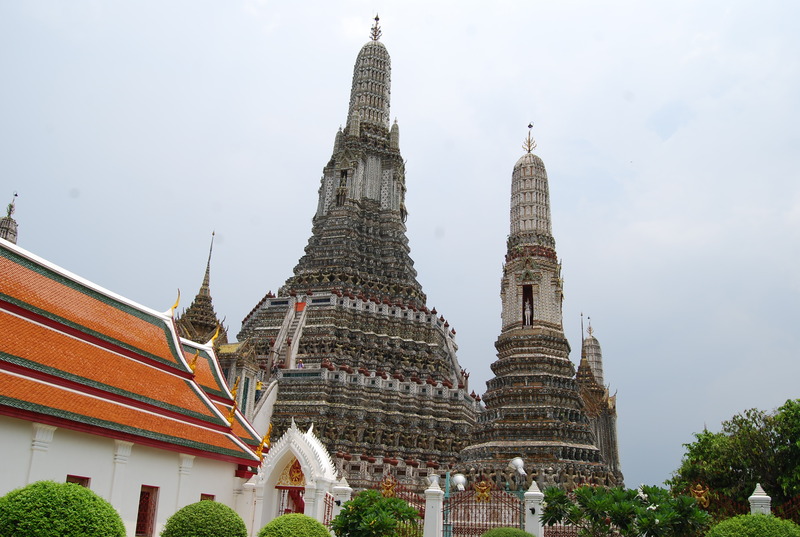 Across the polluted and filthy Nam Mae Chao Phyraya river is Wat Arun, named for the Indian god of dawn. 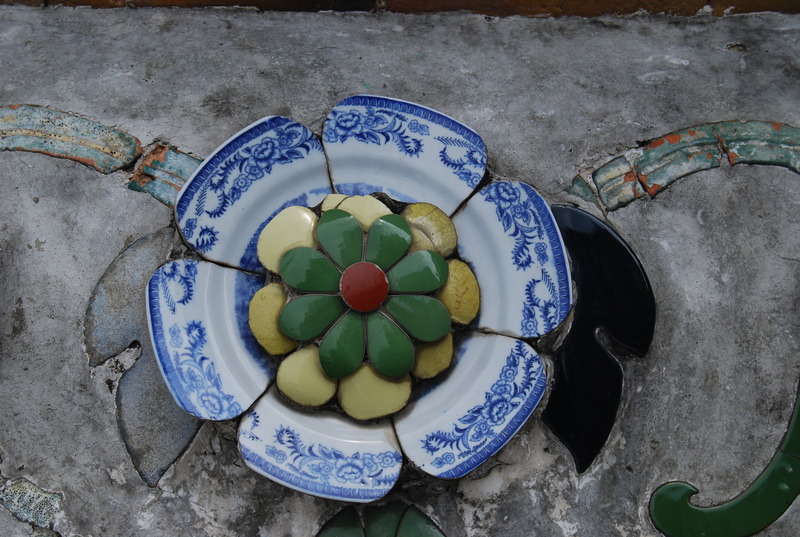 It’s covered in a mosaic of porcelain tiles, some of which are broken plates that have been repurposed for decoration. An 82-meter climb to the peak of the Khmer style spire provided an interesting vantage point to take in the surrounding city. Needing some lunch, it was time to see Khao San Road, or simply, Backpacker Road. This infamous stretch of bars, beat up motels, souvenir shops, laundromats and everything in between is what many envision Bangkok is like. While chowing down on my first plate of pad thai and sipping a local Tiger beer, two other solo travelers sat down next to me. We chatted for a couple of hours — there are loads of friendly farangs (foreigners) here, really unlike anywhere else I’ve been. We’re gearing up now for our 12-hour overnight train (my last!) to Surat Thani. From there, we need to take a 4-hour public bus to Krabi and then hop on the back of a pick-up truck for the last 30 minutes to our somewhat isolated beach destination of Ao Nang.